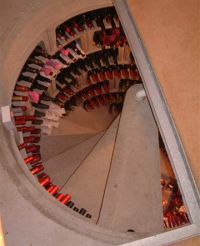 Invented by Georges Harnois in 1978, the Spiral Cellar (SC) is a prefabricated concrete wine cellar which can be installed under almost any home in a week. It comes with its own waterproof butyl liner which means it can be installed in areas with a high water table, and is permanently vented to the outside world via an inlet and outlet pipe (air is drawn in through a surface mounted pipe, and vented down the centre of the Cellar where it emerges and is then drawn upwards and outwards again venting out of a surface pipe. You can feel the draw naturally with your hand). The Cellar itself is 2.00 metres wide and comes in depths of 2.00, 2.50 and 3.00 metres. It is entered via a trap-door in the floor leading to a spiral staircase with a honeycomb of modules lining the walls. The 3.00 metre version will allegedly hold up to 1600 bottles and can be installed in garages, new extensions or any room where there is a 2.50 metre diameter space to excavate. The Cellar can be provided in kit form, allowing you to install yourself, or you can have SC complete the whole project.As the design is internal and below ground, no planning permission is needed, though SC ensure it will comply with local building regulations and engage a structural engineerto liaise directly with the local Council. 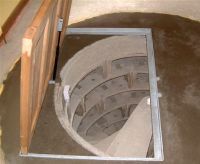 Deryn Hemment from Spiral Cellars came to look at the house in mid-January and recommended we install it in our study, which had a concrete vented void, and therefore needed a reinforcing concrete ring within the gap. I opted for the 2.50 metre version. The first skip was delivered on 28th April 2001, and work commenced on Monday the 30th. 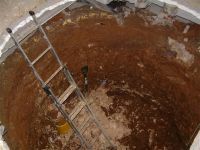 In all, the job of building the cellar took four days – and all done by hand.Once the Cellar is completed, you have to let it dry out (over 3 gallons of water goes into making the base slab alone). This takes a couple of weeks naturally, or less with a dehumidifier. Then you are free to store away.As far as temperature variations go, it seems to reach a maximum of 16.5 degrees centigrade in summer and shows little or no fluctuations maybe dropping by 1 degree in winter.